Our NEW Eddy line is that little touch of modern meets function. These shadeless lamps are a perfect contemporary touch to any design. Eddys come in 3" diameter cylinders and 4" diameter cylinders. NOTE: oversized LED Edison Bulbs are sold separately and not included in price. Pictures have bulbs to show function. Creating each lamp by hand from high fire porcelain china clay, our ceramic lamp forms are bisque fired, glazed, and fired again to 2300 degrees making our lamps extremely strong and durable. We mix and formulate all of our unique crystalline glazes. The crystals (or bubbly patterns) seed and grow during the firing process inside the kiln. We don’t paint bubble patterns on or throw anything into the kiln to get that effect. It’s all just in the chemistry of the glaze. Because this magic happens in the kiln, each piece will have slight variations in size, number, and placement of the crystals. Which is cool…because every piece has its own charm! The base of the Eddy lamps are a deep charcoal metal base. 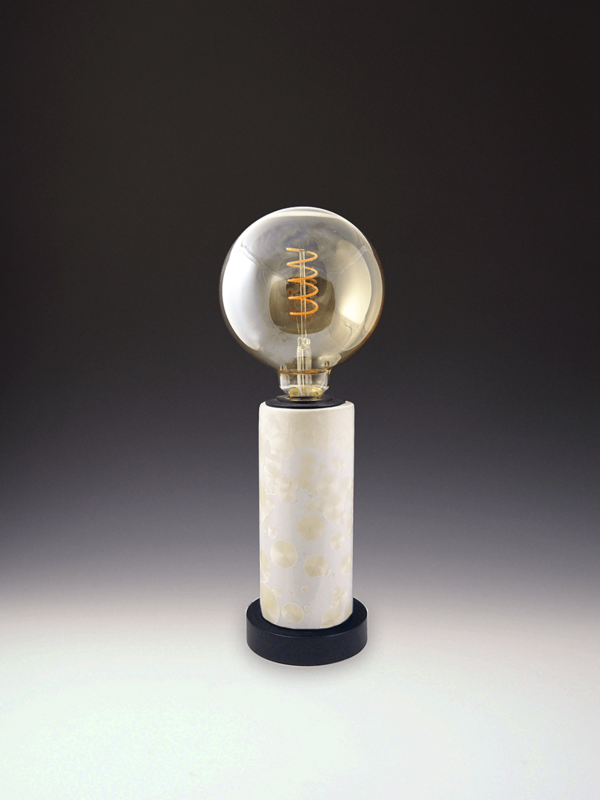 Oversized LED Edison bulbs are sold separately. Note: Because our products are handcrafted and made-to-order please be aware there will be slight variations in glaze color and crystals. All items ordered in pairs or sets will be a very close match but each piece will be unique. Our lamps are made to order. Standard orders please allow 2-3 weeks for us to create your piece. Custom orders please allow 4-6 weeks to create (a lot of drying time with clay that cannot be rushed). All orders ship via UPS Ground and will arrive to you within 2-8 business days from ship date depending upon location. Unfortunately we cannot ship to Post Office Boxes. You will receive an email when your order ships out with your UPS tracking information so you know when to expect your order to arrive. Please contact us for quotes on expedited shipping and international shipping. Feather dust or wipe down porcelain base with lightly damp soft cloth as needed. Dry dust or lint roll the shade as needed.